It is Steve’s lifelong aim to serve God in any ministry place or position God deems as right for his talents and abilities. This has been in the role of pastor since 1990, and Steve believes that this will continue to be the direction for his work. As such, Steve is passionate about the proclamation of God’s word and leading His church in the two-fold purpose of evangelism and discipleship. In October of 2014, Steve was awarded the degree of Doctor of Divinity which he earned from Masters International University of Divinity. He did his undergraduate work with Oklahoma Baptist University. He is a veteran of the United States Navy, a certified bus driver and commercial truck (18 wheeler) driver. Steve has been married to Luann since 1991. They have three grown children, and a wonderful daughter in law, all of whom understand their role in ministry and accept it with none of the stereotypical PK stuff. The whole family simply loves Jesus and wants to serve Him. 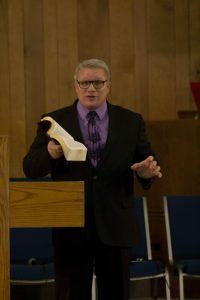 Currently, Steve is the pastor of Second Baptist Church in Okmulgee, Oklahoma, where he has served since April of 2011. This is his 4th pastorate since 1990. He has also served in Oklahoma City, Red Oak, Oklahoma and Palmdale, California. Steve is the U.S. director of Flame of Fire Ministries. Based in Malawi, Africa, FOFM focuses on evangelism and church planting. On his annual trips to Malawi, with ministry excursions to Mozambique, Zambia, and Tanzania. FOFM has also worked in the US in Oklahoma, Wyoming and Kentucky. Before she passed away, Steve’s grandmother informed him that he was a ninth generation Baptist preacher. Finding it hard to believe, Steve set out to verify this information. It did not take a lot of research to prove it was true. In fact, Steve found that he has a heritage of faith that dates to at least the early 1600’s. Steve loves music as well. He plays several instruments – none of them very well. He also enjoys writing and hopes to be found by one of those publishers who knows what a best seller is supposed to look like, believing his to be one of them. Strangely, added to this mix, is the fact that he really enjoys driving 18 wheelers. It is as relaxing to him as some find fishing (which he also enjoys). Most of all, Steve enjoys preaching and teaching from his favorite book. He is very grateful that God has allowed him to do that very thing nearly every Sunday and Wednesday since June 1990. He hopes for at least enough more to match his father’s more than 52 year preaching ministry. Steve has preached or taught on 3 continents, and two oceans. Steve is proud to be a preaching preacher’s kid with preachers kids.